Don't you just hear the angels singing praises? Because I most definitely do. Their song feels my ears with great, great joy. Joy that.... Freshman year is officially over and it's SUMMER! My smile is currently too big for my face. I am so delighted that I am no longer at the bottom of the food chain in the wild hunt that is high school. I am more ecstatic, however, about the fact that I am now free from school work for two and a half months (granted I do have Driver's Ed. next week which will probably feel like school). As a start to this summer my mother and I had a bit of a girls' day :) so it shall be shared with you pretty people. We went to lunch (corner bakery's california grille sandwich=happiness inside me). 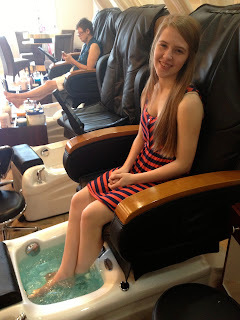 After, we got a "Deluxe Pedicure" at a place called Bella's Salon or something like that. I have to say I love getting my nails done, but the first part where they like rip out your hang nails and even just filing my toenails kind of hurts.. That could just be me though. And oh my goodness! I am a goner when they like take off the dead skin with the... cheese grader (at least that is what I think they used on me this time)... I try my best to not flip out and cry laughing every time, but I never succeed. Lastly, we went to get bubble tea at "Cafe Au Lait", which is pretty much the tastiest thing i shall ever try. Now, I am about to walk out the door for dinner with my daddy and I will most likely just catch up on "The Vampire Diaries" tonight or just watch movies and be delightfully lazy. So it seems this summer has started off well, but I am almost certain that the fact that it is summer will not kick in until like next week. And that is everything! So... Yeah. Happy Summer everyone! I hope it exceeds all your hopes.